Of all the different book formats readers can choose from (think physical books, ebooks and audiobooks), audiobooks are currently experiencing the biggest, fastest rise in popularity, according to the Association of American Publishers. As an increasing number of book lovers search for more efficient ways to read and make the most of their spare time, audiobooks are gaining serious traction. A fact that Playster, the world’s only unlimited audiobook service, is embracing whole-heartedly. As Quartz explained so well in an article titled ‘America’s unhealthy obsession with productivity is driving its biggest new reading trend’, most people these days are “fearful of mono-tasking, find downtime distasteful, and feel anxious around idleness.” And that’s where audiobooks come in. But not all audiobook services are created equal. Many of today’s most popular platforms force you to pay for individual titles (anywhere from $10 to $50 per book, sometimes more). 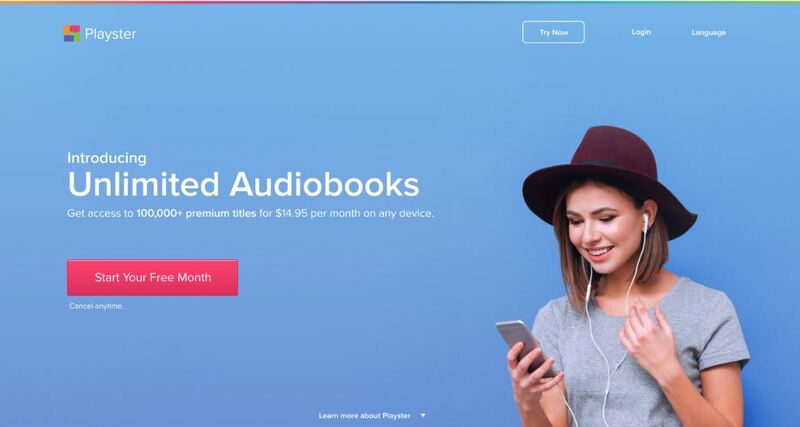 Meanwhile, others offer a monthly subscription, which sounds appealing, but in reality, it limits you to one audiobook per month. Once you’re hooked, you’ll need to pay for additional credits which can then be exchanged for more audiobooks. With Playster, book lovers are able to maximize their reading time and save money. Yes, really. For just $14.95 per month, Playster will let you listen to as many of its 100,000+ premium audiobooks as you want. Let a celebrity narrator entertain you while you’re stuck in traffic, fly through New York Times Best Sellers while running errands or discover new authors while doing household chores. Signing up for the free trial is very easy and will take you less than a minute. You simply put in your email address and follow the steps on screen to create an account. Playster is home to audiobooks from all of the world’s biggest publishers and hundreds of new titles are added each week on the same day they’re released in hardcover. Each month, this revolutionary service will let you listen to all of them for the price of one paperback — no restrictions. Read more than ever before and save hundreds of dollars? It’s a dream that Playster has already turned into a reality for 60,000 avid readers around the world. You can join them by starting a free 30-day trial today!